The Italian soccer club Cagliari Calcio was established in 1920 on the island of Sardinia. They have won Serie A once, in the season 1968-1970 and in addition Serie B and Serie C in some occasions. They have also won the Coppa Italia once, in the season 1968-1969. The best result in European competitions was made by reaching the semi-finals in 1993-1994 UEFA Cup. 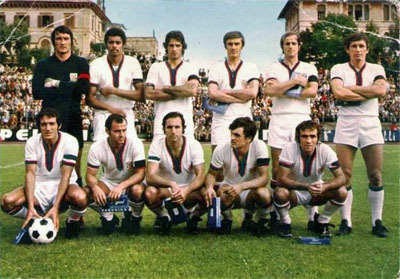 The team in august 1972. The best period for Cagliaria was during the second half of the 1960s and the first years of the 1970s. One reason was the striker Luigi Riva who made 164 goals for the team between 1963 and 1976.